Semi-desert, foothills. Woodlands, roadsides, openings. Summer, fall. Oxybaphus linearis has a growth pattern similar to Mirabilis oxybaphoides: spreading in large clumps to several feet in diameter and from 8 to 40 inches tall. Stems are light green to green-white, leaves narrow (hence "linearis"), and flowers are small, abundant, and in three-flower clusters -- although one, two, or three flowers at a time may be blooming. The plant pictured had only one flower per cluster in bloom. Flower color can range from white to pink to red/purple. Fine hairs cover the bracts, stems, and leaves. "Oxybaphon" is Greek for "saucer"; the word alludes to the flattened involucre, the cluster of bracts (red and green in the picture) at the base of the flower. Bracts of each flower are joined at the base (as can be seen in the purple bracts of the flower at the right side of the picture) and the three bracts in each flower cluster are fused (as can be partially seen in the left flower). Charles L'Heritier (1746-1800) named the Oxybaphus genus in 1797 and Robinson named the species. The Mirabilis linearis name was given by Anton Heimerl (1857-1942) in 1901. 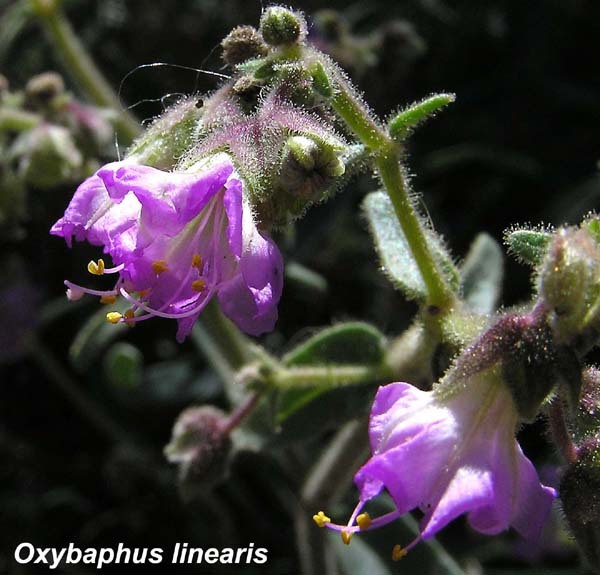 Alice Eastwood collected the first specimen of this plant near Butler Spring in San Juan County, Utah in 1895.